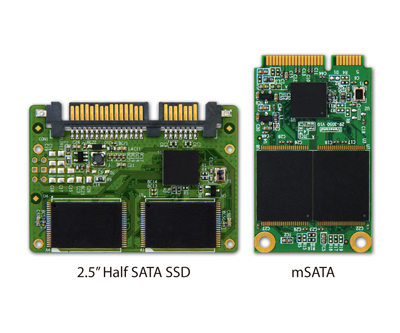 Transcend extends its low-profile mSATA and half-slim solid state drives with two new SSD modules which are designed especially for notebooks/netbooks, tablets, GPS, and mobile internet devices. The mSATA SSDs measure 29.85 mm x 50.8 mm x 3.5 mm, similar in size to a business card and adhere to the JEDEC MO-300A standard for small form-factor SSDs, as well feature a high-bandwidth SATA 3Gb/s interface. The other one Transcend’s half-slim SATA SSD modules are in bigger form factors, 54 mm x 39 mm x 4 mm, but still much smaller than 2.5” SSDs—only one eighth the volume. It uses the same SATA connector that is used on 2.5” hard disk drives and SSDs, has a Error Correction Code functionality and is compliant with the MO-297 JEDEC standard.